Thanos is supposed to be a godlike being. In the original stories, his bloodline was literally tied to the gods of Greek myth. This was later retconned so that the family line was attached to Jack Kirby’s Eternals. So instead of being a brother to Zeus, Thanos’s father Mentor was made brother to Zuras, the Eternal equivalent. This still leaves Thanos several steps up from humanity and possessing extraordinary power. And of course he was raised on another planet. Under these circumstances, one would logically expect his birth and childhood to be very different from that of a conventional, everyday human being. Yet there we are at his birth, in some kind of space hospital, with space doctors and nurses acting very much like the regular doctors and nurses we have here on Earth. This is followed by an all-too conventional childhood attending a conventional school with your run-of-the-mill bratty classmates. Through it all, Thanos appears to be a perfectly delightful little boy, who smiles when he’s happy and experiences a weak stomach when he witnesses his first dissection in science class. He even thinks about having a “girlfriend” someday and considers getting flowers for her. Honestly, I don’t know what the creative staff was thinking when they came up with this. They took one of the greatest comic characters and gave him a background that is utterly ordinary. Mundane. Worse still, the story seems to be designed to make Thanos sympathetic. This is an even bigger error. Thanos should be an object of terror and horror—never sympathy. Granted, this is only the first issue and I have no idea what’s to come in the next four, but this is a terrible foundation that’s been laid here. Instead of being a monster, the young Thanos comes off as, of all things, a victim. The doctor who delivered him apologizes that the innocent baby Thanos survived his birth. (Why? Because he looks hideous? It’s never explained.) Thanos’s mother then tries to kill him almost immediately afterward. His father basically ignores him. At one point, Thanos mentions his handsome and popular brother, Eros, betraying a degree of insecurity. The kids at school remark about his strange appearance, pointing out the loneliness and isolation Thanos likely deals with. Then there’s a cave-in that leaves Thanos and a bunch of his classmates buried for three days. Thanos is the sole survivor after his classmates end up eaten by lizards (don’t ask). Everyone thinks Thanos is somehow responsible for the deaths of these classmates even though he is not. It appears the idea behind this series was to portray and explain just how Thanos became a monster. But the impression I always held is that nothing “made” Thanos into a monster; he just was one. Despite being born into paradise, a child of gods, he became a monster for no logical, discernible reason at all. To me, this not knowing, this not understanding, is far more frightening. Any attempt at explanation runs a great risk of robbing the character of much of his power. Certainty is not always a good thing. In this instance it’s the worst thing. And again, if you insist in filling in his background, why would you make it so damn ordinary? Being unpopular or a misfit in school (or feeling like you are) is not merely a common experience, it’s a damn-near universal one. Really, so Thanos wasn’t a popular kid in school? And this is why he became a mad god who worships death and wants to extinguish all life in the universe? I’m reminded of that Seinfeld episode where George decides to do the exact opposite of everything his first instincts tell him to do. Because this story is the exact opposite of everything Thanos’s origin story should have been. Moreover, it seems to be the opposite of what creator Jim Starlin, originally envisioned. 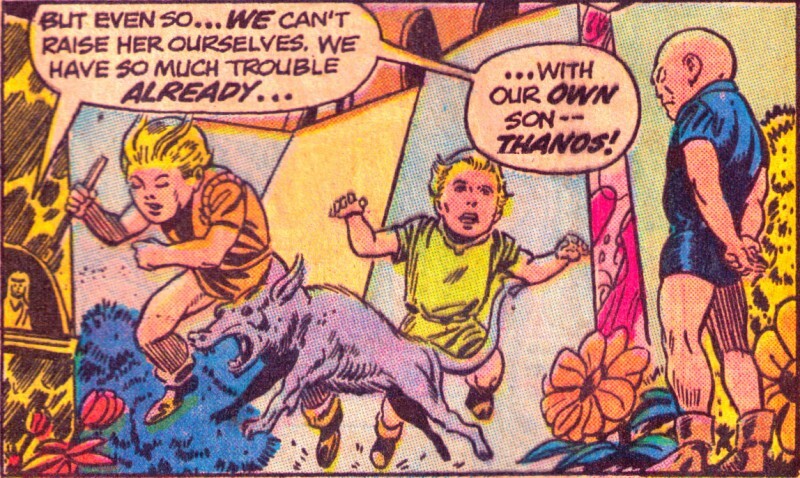 Jim Starlin’s sole image of Thanos as a child. As one could have guessed, I was never a fan of this explanation. I always thought Thanos’s appearance was the result of his own actions somehow, like he willfully scarred himself for some twisted reason; perhaps a demonic ritual of some kind. Regardless, the fault here lies with the retcon, not the creators of Thanos Rising. But that’s the only pass they get. Any other failings that emerge in Thanos Rising are solely the fault of the present-day creative staff. (And I can’t honestly say how much of it falls on Aaron, since these days one can’t be sure just how much of the creative direction of a project is dictated by higher powers. Considering that Thanos is lined up to be the big bad in the next Avengers movie, I’m guessing the editorial oversight was more than a bit heavy here.) These failings consist of basically everything else presented in this first issue. Thanos’s mother, Sui-San, is another major problem. When we first see her, she’s trying to murder her newborn son with a knife immediately upon his birth. I think what the creators were going for here is to demonstrate that Thanos radiated pure evil from the moment he was born—so much so that it compelled his own mother to seek his destruction. The problem is that the Thanos they show us afterward completely contradicts such an idea. He is not remotely evil—in fact, the Thanos we see is a sweet and tender kid. The end result is that Thanos is turned from villain to victim. Instead, it’s his mother who is the villain; she’s the one whose actions seem mindlessly hateful and make no sense. The same quandary (though less extreme) exists with his father, Mentor, who is portrayed as woefully neglectful, even outright dismissive, of Thanos. Once again, the parent is made to look like the villain. In both cases, it sabotages the larger dramatic purpose (i.e., make Thanos an utterly evil and terrifying monster) and also subverts Starlin’s original vision. The phrasing here would seem to imply that Thanos didn’t appear to specifically target his mother in this nuclear assault, nor did he seem to make any attempt to spare her. He didn’t give it any thought either way because he simply didn’t care. He was a soulless fiend who literally thought nothing of the life of his own mother. The background this new series offers us, however, would give Thanos a motive for targeting his mother: revenge. Cheap, petty, everyday revenge. It would also suggest the very same motive for later overthrowing his father as Titan’s ruler. Such simple motivations drag Thanos down to a very human level, thereby destroying the character’s larger mystique. Everything else just adds to this destruction. The all-too-earthly milieu. Young Thanos’s portrayal as some socially awkward nerd who just wants a girlfriend. The obnoxious classmates in the schoolyard. Seriously, put some red hair on Thanos’s head and this could have passed for an issue of Little Archie. …And then there are the lizards. I can’t even begin to explain the lizards. I haven’t mentioned the art at all, which is unfair. Italian artist Simone Bianchi’s work is beautiful to behold here, but I’m afraid the story he’s been given to work with is so flawed that it is ultimately a wasted effort. Hopefully he’ll get something more worthy of his talents in his next endeavor in American comics. In closing, let me reiterate that this is only the first issue of a five-issue series and the remaining installments could be fantastic on their own. But this first issue is a mess from which to try and develop anything, which, for me, renders the entire series the proverbial house built on sand.